Planting isn’t just a springtime activity. There are plenty of veggies you can plant right now to ensure you garden continues as late into the year as possible. Make sure you know the “first frost” average for your area. Remember, we could see some in this area by mid-September. So, hurry now, pick up some more soil, and grab some seeds and get to work! You can get your kids involved with this. They might find it more fun to eat veggies if they helped grow them. 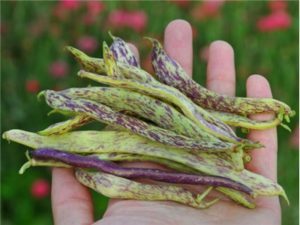 Have you heard of Dragon’s Tongue Bush Beans? These are fast growers (60 days from planting) and look interesting as well. They change color from green to yellow to purple. These are great July planters and will need full sun and warm soil. 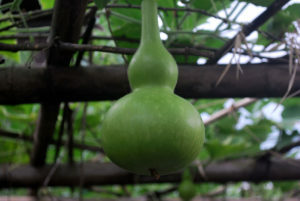 Baby Bottle Gourds are another fall vegetable that look cool and are super easy to grow. You’ll need these in the ground now if you want them by end of October, as they are a 110-day grower. These are also easy to take care of. They need little water and lots of sun. Don’t forget the lettuce! Now is a great time to plant lettuce as it will start to get a bit cooler when the lettuce is ready to be picked and eaten. It takes just about 50 days from planting for most lettuce to be ready. A few types of lettuce to try right now: Red Velvet, Speckled, and the always-popular Swiss chard. Have you thought about garlic? July –September is the BEST time to plant garlic. It will be ready for harvest NEXT July. Right now, other great growers that can survive light frost and take nearly 70-80 days to grow are radishes, cauliflower, broccoli, beet and basil. If you are going to start planting a second round of crops, make sure you turn the soil over and get new soil to mix in as well as some fertilizer. Just like in spring, get rid of the debris; stems and roots from the first plants. It’s advisable to wait a week or two after turning the soil before you plant. Let us know the size of the area you are planting and we can help you with how much soil you’ll need. We still have plenty of time before it gets too cold and we shut ourselves inside for winter. Let’s keep on enjoying our gardens!